Auckland is (in my opinion) one of the most beautiful cities in the world. 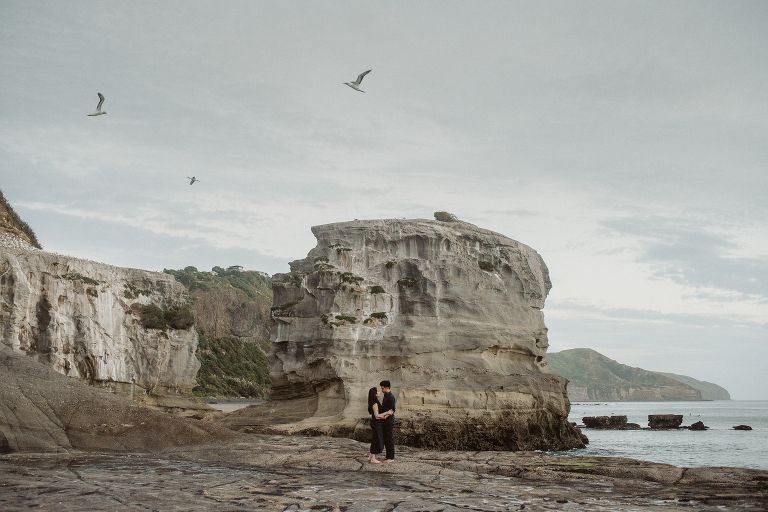 It is one of the best locations for an engagement photos in New Zealand, due to its unique combination of gorgeous beaches, clean city streets, stunning waterfalls, large forests (housing beautiful native trees) and volcanic cones boasting wonderful 360 degree vistas of the city. You have so many options for engagement photographs! This blog post will go through my personal top locations for engagement photos in Auckland. One of the most unique things about Auckland is the fact that you can see the sun rising at the start of the day and the sun setting at the end of the day. This is because it has both an east and a west coast; if you look at a map, it’s on a pretty narrow piece of land. It is rare for a city in New Zealand (or anywhere for that matter) to have this feature. This list is based on my own experience of photographing engagement shoots in Auckland – I have done many of these so I know these locations very well. Muriwai Beach is simply amazing. In my opinion it is one of the absolute top locations for engagement photos in Auckland. It is in West Auckland, which in my opinion is the most beautiful part of Auckland. It is home to one of the best images I have ever taken. The first image below won the best engagement photo competition in the world in 2017 (for more on this, see this page). It is also home to some of the most amazing sunsets I have ever seen. If you are lucky enough to get a sunny day, you will see the actual sun dipping down below the horizon! Muriwai is also home to a gannet colony, which means that birds are constantly flying overhead (you might just be lucky enough to get some in your photographs!). It has interesting rock formations, sparkling black sand and if the tide is right, we might just be able to sneak into the cave for some dramatic portraits. Tips: if the tide is too high, the cave is not accessible, so it’s worth checking this out in advance. The light is best at sunset, but there are normally some tourists and members of the public on the beach. This has never been an issue for me as the beach is quite big and generally people are respectful. For an entire engagement shoot taken at Muriwai Beach (by me), click here. Maori Bay is also on the West Coast of Auckland. It is also one of the absolute top locations for engagement photos in Auckland. I will admit that I might just be a little biased towards this part of Auckland, but it’s honestly so stunning! It is actually very close to Muriwai Beach, but the photographs it offers can look quite different. At Maori Bay, you are directly below the gannet colony so you will hopefully get birds flying into the background of your photographs. It is also a black sandy beach and is much smaller and less crowded than Muriwai Beach. It has a cave, which is in my opinion, better that the cave at Muriwai Beach, due to its size and the fact that it has two openings. This means there are lots of spots with beautiful light for photographs. Tips: Maori Bay is slightly harder to get to than Muriwai. The beach is lower than the car park and you need to walk over some rocks to get to the actual beach. I wouldn’t recommend wearing heels. Karekare Falls in the Waitakere Ranges in West Auckland is my favourite waterfall in Auckland for engagement photos. Not only is it mostly tourist free (well it has been every time I have been there), it is super close to the road. I am talking a 2 minute walk, if that. If you are not big on hiking, then Karekare Falls is the waterfall for you! Most waterfalls in NZ (in my experience) require at least some hiking, so this waterfall makes the top of my list for ease of access! It has a beautiful combination of a waterfall (who doesn’t love a waterfall in the background of their engagement photos?) and some lush green forest. It is also walking distance to Karekare Beach (which is also on this list, further down). Tips: I will warn you, there are eels in that water. They don’t seem to bite though. If you don’t like eels, Kitekite Falls might be a better option for you. We are not swimming there though when we do an engagement shoot, so it’s fine! One of the most beautiful things about Piha is this really big rock covered in greenery. There are also lots of smaller rocks. Again, I feel like I am not really selling this. Rocks, needing to be rescued from the sea. I might let the photographs speak for themselves. Below are some photograph taken on Piha Beach. The rare black sand is really quite striking. Tips: Piha gets mind-blowing sunsets, so this is the best time of day to go there. It is a popular beach so there will be many members of the public dotted all over the beach – surfers and tourists. Due to its size this should not be an issue; you might even end up with a surfer in your photos! Kitekite Falls is also on Auckland’s West Coast. It is a sweet little waterfall that cascades into a swimming hole nestled in the Waitakere Ranges. It is a bit of a hike to get there (with some uphill parts), but the water below the waterfall is entirely safe to swim in and I can confirm that, in my experience, it is eel free. The best part of hiking to Kitekite Falls (especially in the heat) is being able to jump into that clean, fresh water once you get there. We can go into the water for your engagement photos if you like – I am keen! Tips: I would allow around 40 minutes to one hour for the hike (depending on fitness levels). It isn’t the hardest hike in the world but it does require some fitness. I would allow an extra two hours (on top of shooting time) to get there and back. Also, there are likely to be tourists swimming in the water and they tend to stick around for a long time, only to be replaced by more tourists when the original tourists leave. I would go at sunrise if you want to avoid people potentially getting in the background of the photographs. The North Shore has some amazing beaches, which look exceptionally different to the West Coast beaches – it’s hard to believe they are even in the same city! These beaches are on the East Coast, so if you want to see the sun itself, you can see it at sunrise! The North Shore beaches boast golden sand, sandy coloured rocks, turquoise water and a view of the volcano, Rangitoto. They are popular beaches for swimming in the summer months. 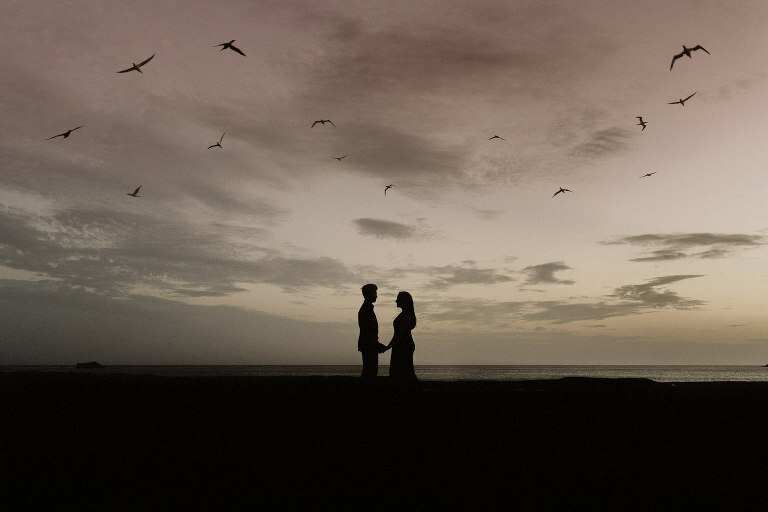 Here are some images from an engagement shoot that I did on a North Shore beach. We all got into the water (mostly because we could), which was so much fun! The beach in the photos is a little hidden cove – we went there at sunrise and it was completely deserted. Other gorgeous beaches on the North Shore include Cheltenham Beach, Narrow Neck Beach and Takapuna Beach. Tips: At sunset these beaches are likely to have people on them, but they are big enough that it should not be an issue. To avoid people entirely, I recommend going at sunrise; this also means you will see the sun come up over the ocean. Tawharanui Peninsula is slightly north of Auckland and projects into the Hauraki Gulf. It is home to the Tahwharanui Regional Park and has some pretty beautiful beaches, which have been practically empty every time I have visited them (even at peak times)! I know of one particular beach along the peninsula with white sand, a cave and a giant rock. This is one of my favourite beaches in the Auckland region! Tips: It is a short walk from the car park to my favourite beach. Tawharanui Regional Park is around 1 hour 20 out of the Auckland CBD (by car). Bethells Beach is incredible. 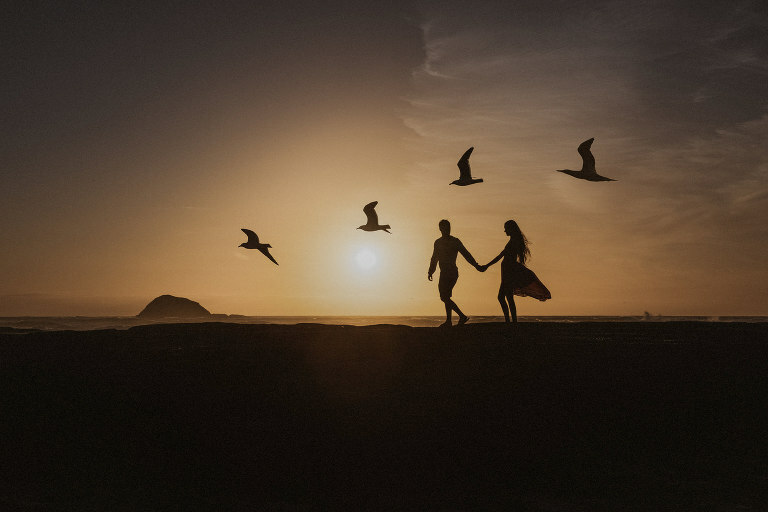 It is on Auckland’s West Coast and is one of the best locations for engagement photographs. It has huge desert-like sand dunes and not one but two caves. It also has some interesting rock formations, which form a very unique backdrop. The sunsets there are out of this world. Tips: It is a short walk from the car park to the beach itself. The drive to get there is beautiful, but can be windy in parts. Bethells Beach can often be quite busy, so I would arrive early for your shoot to allow time to get a car park! Sometimes you need to drive around for a little bit as the car park is quite small. The beach is very large so even if it’s busy, this should not affect your photographs. You have to walk along the entire length of the beach to get to one of the caves, but it is fully worth it! Maraetai Beach is in South-East Auckland and is probably the beach I have visited the most out of all of the Auckland beaches. This is mostly due to the fact that our house is quite close to it, and we can take the dog there! It is more of a calm bay than a beach, but it has beautiful blue water surrounded by rolling green hills. It doesn’t have as much variation in the landscape as the West Auckland beaches, but it’s still worth a visit, particularly if you live in South Auckland. The images below are from a wedding portrait shoot but I wanted to showcase how beautiful Maraetai looks in this light – this was right before the sun went down on a cloudy day. The water looked very blue on one angle and completely green on another! Tips: There is not a lot of sand to work with as the water comes up quite close to the road, so I suggest looking at the tide times and attempting to go at low tide – this will mean it is easier for you to walk along the beach! I have always easily managed to get a car park on the side of the road. The Auckland Botanic Gardens is a great location if you want a garden setting for your engagement images. It is also a great option if you want a location in South Auckland (as I know a lot of the locations on this page are out west!). The Auckland Botanic Gardens is unique because it has some incredibly interesting looking plants that definitely don’t seem to grow in the South Island (where I grew up). It also has plants from NZ (and around the world) that are threatened with extinction. It boasts a plethora of native plants, a rose garden, a Gondwana Arboretum, a rock garden and it even has a South African garden! Every time I go there I see new, interesting looking plants that I swear I have never seen before. The images below are from a wedding portrait shoot, but the flowers were in full bloom and they illustrate how much potential this beautiful location really does have! Tips: This is a great venue to go to rain or shine as there are some covered parts. The car park has always had spaces every time I have gone there, so I wouldn’t worry about that. The motorway can be pretty congested in that part of Auckland so I would allow extra time to get there. It tends to get quite busy, but because it is large, this shouldn’t affect your photographs. Cornwall Park is gorgeous. Every time I go there, I discover something new, as it’s just so enormous! The best thing about it are the tree lined paths, which can provide shade on a sunny day if you can’t do your engagement photos at sunset. One Tree Hill is gorgeous (it does require a hike) and there are loads of sheep if you happen to want sheep in your engagement photos! We can end up with pretty varied images and it’s loads of fun to explore. Tips: You need to be reasonably fit to hike up One Tree Hill. Cornwall Park tends to be busy, but since it’s so big, this is not normally an issue. Mission Bay has calm topaz water, white sand, a fountain and a great view of Rangitoto. This is a good option if you want to do your engagement shoot at an eastern beach. The best thing about Mission Bay is the ice cream shop across from the beach – based on this alone it’s a huge win in my books! Tips: It does get very busy during the summer months, so I would recommend going at sunrise if you want to avoid people getting in the background of the photographs. We can avoid the public to some degree at sunset, but it is a very busy beach and not massive so it’s generally dotted with people swimming and sunbathing. If you want more of an urban themed engagement shoot then I highly recommend the Auckland central business district. We can amble through the streets and use the architecture to get some interesting photographs which deviate a bit from my landscape type shots. On the way into the city, there is a cycle lane called the Nelson Street cycleway; if you stand in the cycleway we can get a lovely wide angle photograph with the entire Auckland central business district in the background. Tips: Parking is pretty difficult in the middle of the city so I would recommend taking public transport. If you just want the Auckland skyline in your images then I suggest going to either Mt Victoria or Devonport (keep reading…). Just a short ferry ride away from Auckland city, Waiheke Island has some of the most beautiful beaches in the Auckland region. It is definitely worth a visit and a great choice for your engagement photos! The boat ride alone makes it a lovely day out. Tips: Make sure you look at the ferry timetable in advance before you head out to Waiheke so that you can get back to the mainland after the shoot if you don’t intend on staying out there! Devonport is a residential suburb of Auckland over on the North Shore, but it’s a super cute location for engagement photographs due to the historical nature of the buildings. It is also in close proximity to Mt Victoria and has some beautiful beaches. One beach has a gorgeous view of the Auckland central business district. It is a location that you can use to incorporate different aspects of Auckland into your shoot – you can have cityscapes, village and beach backdrops all in the one shoot. Some of the streets are lined with Pohutukawa trees too! The photos below were taken at a Devonport beach at night – you get the best views of the Auckland skyline from here! Tips: I would recommend going at sunset and then doing some night portraits once the sun goes down as the city really comes alive in the background of your photographs at night. Mt Victoria is in Devonport on the North Shore of Auckland. It contains, in my opinion, some of the best views of Auckland in every direction, particularly at night. It is a bit of a hike to get up there (they banned cars from the summit in early 2018), but fully worth it if you are willing hike! There is also a really old gun up there (it kind of looks like a cannon to me) and some random painted mushrooms on the grass, which are apparently vents for a water pumping station. Tips: There are often tourists up there, but they tend to keep out of the way as it’s a big area. There are probably less tourists now that cars can’t drive up there. I hope you found this list of top locations for engagement shoots in Auckland helpful!